Cumulus Linux is awesome, did you know that? I haven’t got deep in to it, really only looked at bridging so far, but here is how you configure interfaces…so I don’t forget. Let’s keep it nice and simple. I have two Nokia 7750 VSRs that I want to bridge together, sros3 and sros8. Both have a single connection over port 1/1/1 to the VX switch. These connections are to connect the various VM ports to the VX from the host machines perspective. What’s this swp stuff? This is what Cumulus will call your interfaces: switchport basically. The management interface of the VX is eth0 and then each connection to a VM is on an swp starting at swp1 and continuing up as needed. Port positioning/numbering is based on the sequence the bridge entries are placed in your VX XML file. The first bridge will be eth0, the second swp1, third swp2 and so on. My XML config for the 7750s is straightforward enough, nothing fancy going on. This portion connects the VX to sros8 only. You need an entry in your XML file for each port. You can configure the sros8_vx1 bridge using VMM if you wish. If you want to throw it in quickly you can add with brctl but it wont be persistent. We then configure the bridge in the VX machine. 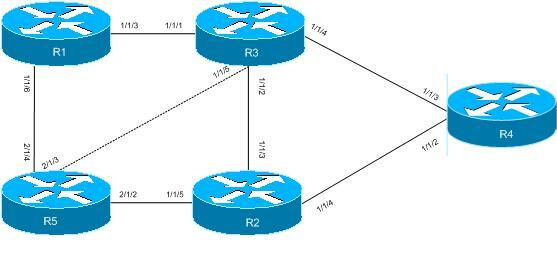 This is the ‘VLAN’ internal to the VX and connects the external VMs (sros3 and sros8) to a common forwarding table using bridge sr3_sr8. You can also use sudo ifup -a to bring all interfaces up. Now, where is that proof pudding for me to eat? 64 bytes from 10.3.8.3: icmp_seq=1 ttl=64 time=1.36ms. I have been really busy trying to get stuff done in work so haven’t has a chance to post anything and any spare time goes on study or family so it’s time to rectify that. This is the topology I will be using for most of the build I do here. If I need to add in other links or devices I will state that. -Routers are called rx with r1-4 being SR1 chassis and r5 is a SR7. I have some testers dotted around the place and a few Ciscos/Junipers connected for various bits I’m doing. I will point out where they are if I end up including them in a post. Service Router OS is the operating system that runs on Alcatel-Lucent 7×50 and 7210 routers and switches. It’s a pretty handy OS and I just love it in the same way Kevin Keegan would love it if we beat them. It is well structured and very flexible and, once you get used to it, it kicks the pants off other vendors I have used, in my opinion. There is a distinct lack of information that I have found on the Internet for configuring these boxes, especially considering the 7750 is apparently number 1 or 2 in the PE market in Europe. In this post I will cover some basic system configurations to get you going. I will be using SR1 and SR7 routers for config throughout these posts although there are other models available, e.g. SR12. The SR1 has a single processor and line card with two daughter card slots (MDA) whereas the SR7/12 have dual processors and five and ten line card slots respectively. In this post I will be using an SR7, its processor slots are named A and B and the line cards are numbered 1-5. The active processor is indicated by either A: or B: at the CLI prompt. Each daughter slot is labelled x/1 or x/2, e.g. slot 2 sub-slot 2 is MDA 2/2. Each processor (SF/CPM) holds a male DB9 console connector (with DCE/DTE toggle switch), RJ45 Ethernet management port and three compact flash slots. The SROS image is stored in cf3 and cf1/2 can be used to store log files etc. In order to boot the chassis we need to configure the Boot Options File (bof) to locate the image and config files. And that’s pretty much it for the bof, just don’t forget to save your work. If you are in the bof context then it is simply save. If you are in any other context you can use /bof save where the use of / allows the subsequent command to be run from any context. This also applies to config and admin level commands too. So that’s it for my first post on this ALU craic. I plan to build up a network from here on starting at the physical basics all the way up to advanced service configuration.